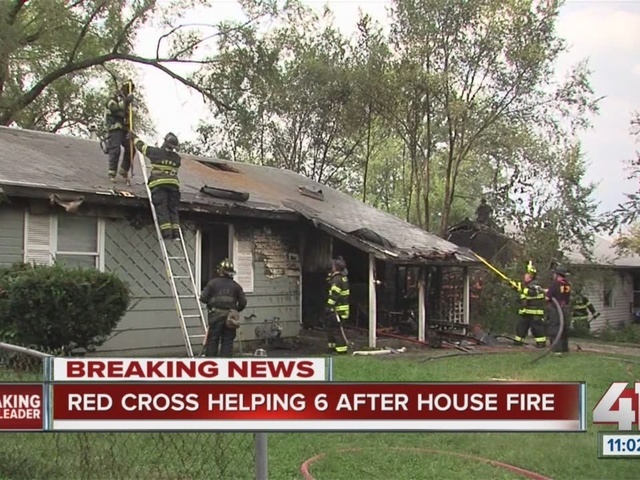 Crews battled a fire that spread between two houses Tuesday morning. Fire and smoke could be seen coming from one of the houses when firefighters arrived at the 5600 block of East 101st Street in southeastern KCMO at about 8:20 a.m. Crews said they had the fire under control at about 8:32 a.m.
No one was at home at one of the houses, and a friend knocked on the door of the other house to wake up the resident. "It was my best friend Curly who lives across the street he said he was getting ready to get on the bus and he just saw that my house was on fire so he was banging on my door on my window trying to get me out," Darius Singletary, one of the residents at 5603 101st street said. Fire crews were reportedly using two small streams of water on both houses. Investigators determined the fire wasn't arson. Both houses are now condemned but won't be demolished. Damage to both houses is estimated to be about $80,000 total. “I'm just glad I was able to get out of there. But everything is gone the house is—we've lived in this house for 7 years and for something like this to automatically happen, It’s devastating,” Singletary said. The Red Cross is working to help the displaced families.